These creators will join us for week-long creator camps at our YouTube Spaces in Los Angeles, New York and London this fall. As part of the camps, creators will attend production workshops that provide a crash course on how to up-level their YouTube content through classes on advanced camera, lighting, and sound techniques. In addition to learning about video production, creators will receive one-on one-advice about their YouTube channel strategy from the YouTube Partnerships team, and they’ll have the chance to network with each other as well as NextUp grads. At the end of the week, creators will leave with a voucher for new production equipment that can help them put their new skills into practice. We can’t wait to welcome these creators to our YouTube Spaces in Los Angeles, New York and London in the coming weeks! For more information, visit youtube.com/nextup and follow the action on Twitter with #YTNextUp. This summer, we opened applications to three special editions of our NextUp camps designed to support up-and-coming Black, Latino and women creators on the platform: NextUp #YouTubeLatino, NextUp #YouTubeBlack, and NextUp #WomentoWatch. School of Life; from educators such as robotics enthusiast Simone Giertz and Spanish science channel ExpCaseros, to MadeYewLook’s channel on body painting. I’m proud that YouTube can provide a place for creators to find fans, success and revenue. The open internet eliminated the barriers of traditional media gatekeepers and ignited a new global creative economy for creators and artists. It has given anyone with an idea the ability to share their passion, find fans all over the world and build a business. Despite best intentions, I believe this may now be at risk as European policymakers prepare to vote on a new European Copyright Directive on September 12. In fact, some parts of the proposal under consideration – and in particular the part known as "Article 13” -- potentially undermine this creative economy, discouraging or even prohibiting platforms from hosting user-generated content. This outcome would not only stifle your creative freedom, it could have severe, negative consequences for the fans, the communities and the revenue you have all worked so hard to create. Creators and artists have built businesses on the back of openness and supported by our sophisticated copyright management tools, including Content ID and the recently launched Copyright Match Tool that manages re-uploads of creators’ content. Copyright holders have control over their content: they can use our tools to block or remove their works, or they can keep them on YouTube and earn advertising revenue. In over 90% of cases, they choose to leave the content up. Enabling this new form of creativity and engagement with fans can lead to mass global promotion and even more revenue for the artist. For instance, a growing list of global artists have seen their songs go viral in fan-made dance videos, such as Drake’s “In My Feelings” and Maître Gims’ Sapés Comme Jamais. Dua Lipa got her start singing covers and Alan Walker allowed his track Fade to be used in user generated content and video games, which helped him build a massive global fanbase. That’s what makes platforms like YouTube special: fan videos have the power to help propel established songs to new heights and even break new artists. This is the new creative economy in action. The Copyright Directive won’t just affect creators and artists on YouTube. It will also apply to many forms of user generated content across the Internet. And that’s why so many other people are raising concerns too. Individuals, organizations (like European Digital Rights and the Internet Archive), companies (like Patreon, Wordpress, and Medium), the Internet’s original architects and pioneers (like Sir Tim Berners Lee), and the UN Special Rapporteur for free expression have spoken out. Creators across the Internet are standing up for their right to create and express themselves, including Phil DeFranco, LeFloid, and TO JUZ Jutro. Growing up behind the iron curtain in communist Czechoslovakia without the openness we now take for granted, I have a deep personal conviction to preserve this freedom. I have made my voice heard here and there’s still time for you to weigh in before September 12th. Every single creator, including you, deserves their say. I hope you will learn more and consider sharing your views on social media (#SaveYourInternet) and with policymakers. Along with the links above, you can also learn more at ChangeCopyright.org. One of the best parts of my job is meeting and speaking with creators and artists around the world. I’m excited to be heading to YouTube’s Creator Summit in Berlin next week where I'll have the chance to do exactly that. The community of YouTube creators that you are all a part of represents a new era of media: from news vlogger Ischtar Isik who has interviewed Chancellor Merkel, to philosopher Alain de Botton's School of Life; from educators such as robotics enthusiast Simone Giertz and Spanish science channel ExpCaseros, to MadeYewLook’s channel on body painting. I’m proud that YouTube can provide a place for creators to find fans, success and revenue. , Cards Against Humanity LIVE, Dancember, Project for Awesome, Pride Live. From live streams to community campaigns, it’s humbling to see how creators around the world use YouTube as a platform to bring together communities and champion the causes they care about. These movements remind us about what is (and has always been) so special about YouTube -- the deep and meaningful connections between creators and their fans, and the powerful impact they build together. 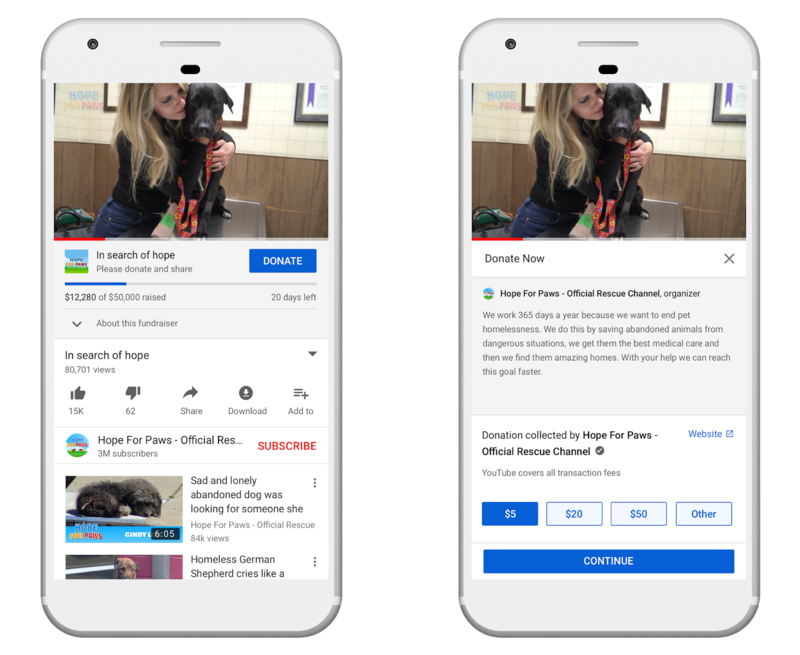 Today we’re sharing a first look at YouTube Giving, a suite of features designed to strengthen the way creators and fans can make a difference through charitable giving on the platform to over 1M nonprofits. These features include Fundraisers (beta), Community fundraisers (beta), Campaign matching (beta), and Super Chat for Good. With this feature, YouTube creators and qualifying US-registered 501(c)(3) nonprofits can create and embed a fundraising campaign right next to their videos and live streams. Fundraisers allow fans to donate to creator-led campaigns directly on YouTube via a “Donate” button, making it easier than ever for creators and fans to raise funds for causes they care about on the platform. Creators can simply set up their campaigns, and let us take care of the logistics and payment processing. This first beta period will be available to a limited group of creators in the US and Canada. If you’re looking to try this out today, check out this Hope for Paws Fundraiser dedicated to raising funds towards animal rescue and recovery. As part of this beta period, YouTube will also cover all transaction fees so that 100% of donations go to the nonprofit. We’re also rolling out a beta version of Community Fundraisers to a limited group of US creators and qualifying US-registered 501(c)(3) nonprofits that allows multiple creators to co-host the same fundraiser. The feature is designed so that a Community Fundraiser will appear on participating creators’ videos at the same time and reflect the collective amount of money their communities are raising together. In time for Childhood Cancer Awareness Month in the US, St. Jude Children’s Research Hospital and 12 gaming creators with over 37 million subscribers combined are teaming up for a special edition of St. Jude PLAY LIVE on YouTube, a fundraising event using the Community Fundraisers beta feature. Check out these creators’ videos to get involved: AbdallahSmash026, Aphmau, AtomicMari, Blessious, Funhaus, IGN, ItsFunneh, JeromeASF, KreekCraft, LaurenzSide, Noahj456, and Smosh Games. In the coming weeks, we’ll also roll out Campaign Matching, allowing creators who organize Fundraisers and Community Fundraisers to receive matching pledges to help amplify their efforts. This beta feature will display matching pledges from other creators or brands directly within the Fundraiser to help inspire more fans to get involved and maximize impact. As with the above betas, access will roll out to additional creators in the coming weeks. Additionally, we’re launching Super Chat for Good which enables creators to raise funds for qualifying US-registered 501(c)(3) nonprofits on live streams and Premiere videos. When an eligible creator enables Super Chat for Good, 100% of Super Chat for Good purchases will be automatically routed to a qualifying nonprofit chosen by the creator. They work like the Super Chats that you already know and love, highlighting your message in the chat stream and showing your support for your favorite creators and the causes they care about. Our inspiration for building YouTube Giving tools has been you -- the way you use your voices to create impact on important issues, whether helping out in a crisis or championing a cause. Over the coming months, we’ll listen to your feedback on these beta features and continue to expand access to more creators. We can’t wait to see how you’ll use these tools to create even more impact with your YouTube channels! #LoveArmyMexico, Cards Against Humanity LIVE, Dancember, Project for Awesome, Pride Live. From live streams to community campaigns, it’s humbling to see how creators around the world use YouTube as a platform to bring together communities and champion the causes they care about. These movements remind us about what is (and has always been) so special about YouTube -- the deep and meaningful connections between creators and their fans, and the powerful impact they build together. 180 million hours of YouTube on TV screens every day. While the future is full of opportunity, it is not without challenges. One of the ways we make YouTube better is through testing and iterations, but we understand that sudden changes related to experiments are difficult to manage. So, in order to minimize the disruption for you, we will make our best effort to communicate with you as these tests approach and we’ll use your feedback to make the features better in the long run. We continue to prioritize communicating more with creators. We made a conscious effort to respond on social media, and we answered 600% more tweets through our official handles (@TeamYouTube, @YTCreators and @YouTube) in 2018 than in 2017 and grew our reach by 30% in the past few months. We’ve also built a new feature than enables us to deliver relevant information in YouTube Studio, formerly Creator Studio. In February, we began testing a new dashboard with a small group of creators, and we recently rolled out it out to all creators on the platform. The dashboard, which launched for all English channels and will soon be available in an additional 76 languages in the next two weeks, now gives you platform updates and news along with performance about your latest videos in one easy-to-find place. Last year, I started my own channel with the goal of communicating more with creators and saw first-hand some of the challenges and opportunities of sharing my voice through video. Today, I’m posting a new video, along with this blog, updating you on the five key annual priorities. Additionally, Creator Insider, an unofficial channel started by YouTube employees, continues to offer weekly updates, responds to concerns, such as notifications, and provides a more behind-the-scenes look at some of our product launches. And most recently, we combined our Creator Academy and YouTube Creators channels, so that you can find both inspiration and education in one place: YouTube Creators. Channel Memberships - Viewers pay a monthly recurring fee of $4.99 to get unique badges, new emojis, Members-only posts in the Community tab, and access to unique custom perks offered by creators, such as exclusive livestreams, extra videos, or shout-outs. We worked with a small group of creators to develop this service and are expanding it to eligible channels with more than 100,000 subscribers and even more creators in the coming months. Merch - We’ve joined forces with Teespring so creators can choose from over 20 merchandise items to customize and sell via a shelf on their channel. This is available to all eligible U.S.-based channels with over 10,000 subscribers, with expanded merchandising partners and availability for creators coming soon. Famebit - Acquired by Google in 2016, FameBit has been helping brands tap into YouTube's audience by using creator's authentic voices to develop unique branded content at scale. Over half of channels that used Famebit in the first three months of 2018 doubled their YouTube revenue. 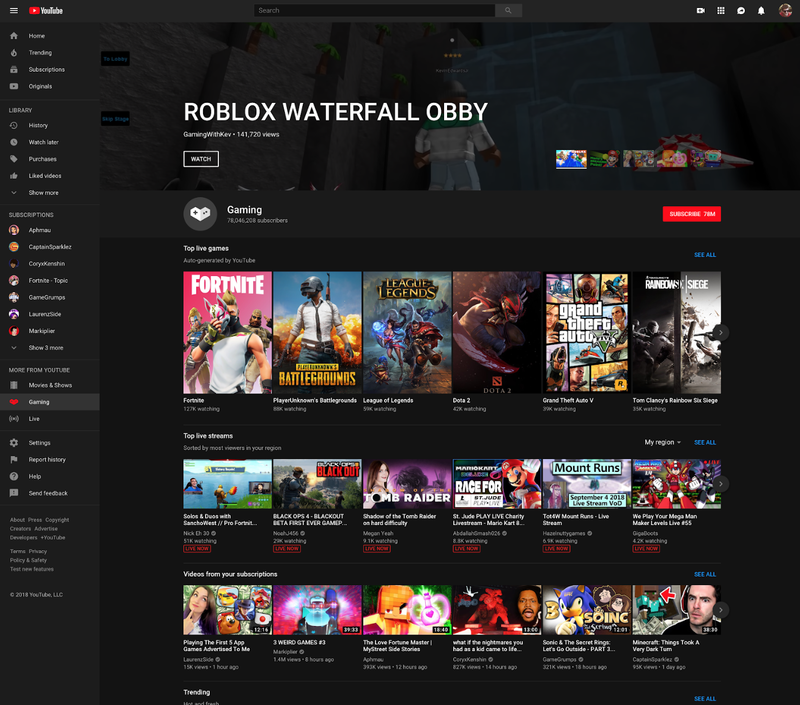 In the coming months, we’ll be launching a feature that will allow users to easily shop for products, apps or tickets directly from the creator watch page. In addition to new products, we continue to invest in YouTube Originals as another way to help creators earn more revenue. Well over two-thirds of our Originals star YouTubers both in front of and behind the camera, and since we launched Originals three years ago, we’ve seen their success have a ripple effect on creators. Some creators have seen as much as a 20 percent increase in channel viewership after their Original has launched. Finally, one of my biggest priorities is to show advertisers the incredible opportunities on YouTube to tap into engaged communities and extend their reach. We’ve been working hard on brand safety and meeting with the biggest brands in the world to share your incredible stories and the progress we’re making together. The results have been positive, and I continue to make this a priority. One of the greatest strengths of the platform is enabling two-way conversations between creators and fans and fans to fans. We’ve been working hard to build out the different ways to enable interactions on YouTube and seeing results. Our overall interactions, such as likes, comments and chats, grew by more than 60% year over year. Our Community Tab continues to be a one-stop shop for growing and engaging with fans. Visible across the platform, these posts let you move beyond just video to build even deeper connections with fans through GIFs, pics, polls, and text. Every day, over sixty million users click into or engage with Community posts. Livestreaming continues to be an area of growth for creators, with watchtime of livestreams increasing by 10X over the last three years. At VidCon, we launched Premieres to help creators take advantage of the popularity of live tools, such as Super Chat and scheduling, by allowing them to debut pre-recorded videos as a live moment on YouTube. We’re also seeing more creators use Stories, a simple way of posting videos without editing or post-production, to engage with their fans as well. We have some key improvements coming soon and later this year, we will expand stories to all eligible creators with more than ten thousand subscribers. Earlier this year, we released the first YouTube Community Guidelines Enforcement Report and we’ll be updating this regularly with new data. We just released the newest update in late June, which you can read here. We also announced our new Copyright Match tool, which uses the matching power of Content ID to help creators find copies of your content when it’s been uploaded by other channels. This will be offered to all creators, including those who are not part of a multi-channel network (MCN). We’ve been testing this tool with a thousand creators over the last year to tailor it to your specific needs and is a great complement to the range of copyright tools we provide. Education is one of the greatest benefits of YouTube. Everyday, people watch learning-related content over a billion times and they’re using it to develop new skills and encourage their passions. I’m proud to announce a new initiative, YouTube Learning, through which we’re providing grants and promotion to support education focused creator content, expert organizations and learners. We're also expanding our learning content team efforts and have a newly dedicated product and engineering team working on building out features for learning on YouTube. Our hope is to support those who use YouTube to share their knowledge with the world and the millions of users who come to our platform to learn. As our devices have become an increasingly important part of our lives, we want to support digital wellbeing. When we rolled out the YouTube Kids app, we included a timer that parents could use to limit the time their children spent in the app. We have since realized that a timer could also be helpful for adults. So, within the broader YouTube app, we’ve launched a feature that sends users a reminder to take a break. We’ve also added an option for users to get a single digest notification once per day from YouTube rather than at the moment notifications, and we enabled users to configure their notifications so that they happen within specific timeframes. As we head into the second half of the year, I look forward to continuing to work with you to create communities and engage with people using video. You are building the next generation of media companies, and I’m humbled by the amazing work you do every day. It’s hard to believe we’re already halfway through 2018. With 1.9 billion logged-in users coming to YouTube each month, our community continues to grow. More and more creators are building their businesses and discovering that they can shape the global conversation with just a phone and an internet connection. While mobile is one of the most popular ways fans enjoy content, more and more people are using their living room screens to watch their favorite creators. On average, users now watch over 180 million hours of YouTube on TV screens every day. for copyright owners to protect their work, but we’ve heard from creators that we should do more and we agree. Today we are excited to announce the new Copyright Match tool, which is designed to find re-uploads of your content on other channels. Here’s how it works: after you upload a video, YouTube will scan other videos uploaded to YouTube to see if any of them are the same or very similar. When there is a match, it will appear in the “matches” tab in the tool and you can decide what to do next. We’ve been testing this tool with creators for nearly a year to make it safe and effective for the whole community. Thank you for all the feedback you provided. It helped us build a product that will help a lot of creators. It's important that you’re the first person to upload your video to YouTube. The time of upload is how we determine who should be shown matches. Once the tool has found a match, you can choose either to do nothing, to get in touch with the other creator, or request that YouTube remove the video. When you request removal you can do so with or without a 7-day delay to allow the uploader to correct the issue themselves. Takedown requests will be reviewed to make sure they comply with YouTube’s copyright policies. You might be wondering: Isn’t this Content ID? No. The Copyright Match Tool does use similar matching technology used by Content ID, but the Copyright Match Tool is a unique tool designed especially for YouTube creators who have problems with unauthorized re-uploads. Next week, we’ll start rolling this tool out to creators with more than 100k subscribers. As this is a powerful feature, we will monitor usage closely and will continue to expand over the coming months with the long-term goal of making it available to every creator in the YouTube Partner program. Thank you for helping to keep YouTube a platform which inspires vibrant creativity and respects and protects creative rights. Learn more about Copyright on YouTube. We know how frustrating it is when your content is uploaded to other channels without your permission and how time consuming it can be to manually search for these re-uploads. We currently provide a number of ways for copyright owners to protect their work, but we’ve heard from creators that we should do more and we agree. I just stepped off the stage at VidCon, a conference created from scratch by Hank and John Green in 2010 that brings together fans, creators, and industry leaders to celebrate the power of online video. I talked about how over the last 13 years, YouTube has grown from an ambitious idea into a worldwide movement built on free expression and the power of openness. With more than 1.9 billion logged-in users who come to YouTube every month and localized versions stretching across 90 countries and 80 languages, we’re opening up the world to anyone with a cell phone and an internet connection. YouTube is a vibrant community where everyone has a voice. Every day, creators use their voice to entertain, spur action and bring about positive change. That’s why over the last year we’ve doubled down on building the products and tools that the creator community needs. Not only to thrive on YouTube, but to continue to develop the video platform of the future. YouTube lets creators connect with their community and gives them the opportunity to earn money while doing what they love. Thanks to advertisers, creators around the world have been able to build businesses, creating an entirely new global economy that’s seen incredible growth. The number of creators earning five figures a year is up by 35 percent and the number of creators earning six figures is up by 45 percent. As in previous years, the vast majority of the revenue is coming from our advertising partners. We’ll continue investing here, but we also want to think beyond ads. Creators should have as many ways and opportunities to make money as possible. We’ve been working on new tools that not only help creators better engage with their fans, they also enable them to make money while doing it. This is an idea that really began last year with Super Chat, a product that allows fans to purchase messages that stand out within a live chat. We’ve seen tremendous success with Super Chat and have since expanded to Ticketing, Merchandise, Channel Memberships and more. We’re also bringing creators and brands together to form unique marketing partnerships via FameBit. With Channel Memberships, viewers pay a monthly recurring fee of $4.99 to get unique badges, new emoji, Members-only posts in the Community tab, and access to unique custom perks offered by creators, such as exclusive livestreams, extra videos, or shout-outs. Channel Memberships have already been available for a select group of creators on YouTube as Sponsorships. We’ve seen a lot of creators find success with this new business model. So, we’ll soon be expanding this to eligible channels with more than 100,000 subscribers on YouTube under the new name Channel Memberships. We hope to bring it to even more creators in the coming months. 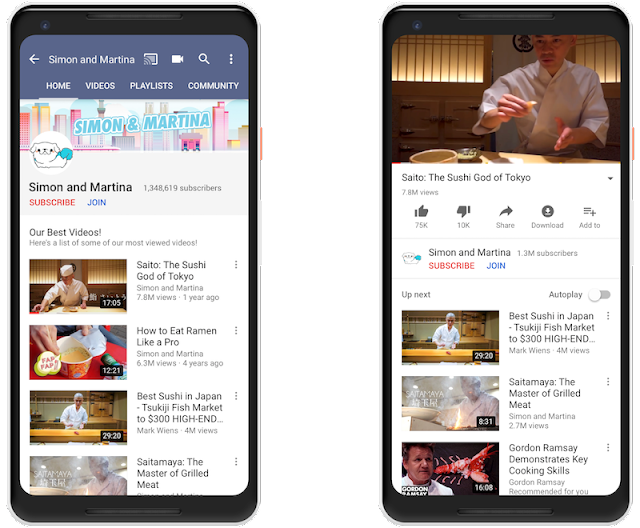 Creators who have already been experimenting with this feature on YouTube have seen encouraging results. Since launching in January, comedy creator Mike Falzone more than tripled his YouTube revenue. And traveling duo Simon and Martina have built a closer-knit community and revamped a miniseries exclusively for their members, in more than 30 countries from Finland to the Philippines. Merchandise has been a part of many creators’ businesses for a long time. We want to make it easier for more creators to sell merch directly from their channel. So we’ve built a product that allows them to do just that. From shirts with a logo to phone cases with a creator’s face, we’ve joined forces with Teespring so creators can choose from over 20 merchandise items to customize and sell via a shelf on their channel. This will be available to all eligible U.S.-based channels with over 10,000 subscribers starting today, and we plan to bring even more merchandising partners and creators in soon. Just take a look at Joshua Slice’s merchandise shelf. The creator of Lucas the Spider recently turned his hero character into a plushie selling over 60,000 furry friends and generating over $1 million in profit in just 18 days, according to Teespring. The engagement between fans and creators is at the heart of YouTube. We’re working on new ways to help creators strengthen those unique bonds. Livestreams have brought the YouTube community together during the biggest music, science, and gaming events. We’ve also built a Community Tab that allows creators to move beyond just video to build even deeper connections with fans through GIFs, pics, polls, and text. And we’ve started experimenting with our take on Stories, but designed specifically for YouTube creators—coming to all eligible creators with more than 10,000 subscribers later this year. Today, we’re introducing a new way for creators to upload content to YouTube called Premieres. With Premieres, creators will be able to debut pre-recorded videos as a live moment. When creators choose to release a Premiere, we’ll automatically create a public landing page to build anticipation and hype up new content. When all fans show up to watch the premiere, they’ll be able to chat with each other (and with the creator!) in real time via live chat. It’s as if a creator’s entire community is in one theater together watching their latest upload. Premieres are starting to roll out to creators today and will be available broadly soon. If you want to experience one for yourself, check out some upcoming premieres from creators such as Leroy Sanchez, JacksFilms, Jackson Bird, and Ari Fitz, with more Premieres coming from Corridor Digital and Inanna Sarkis soon. YouTube creators are the heartbeat of our platform. That’s why we’re committed to building products that empower and support the creator community. We hope these tools help creators build a stronger community and earn more money while doing it, because when they succeed, the entire YouTube community thrives. Neal Mohan, Chief Product Officer, recently watched "Lucas the Spider - Plush Introduction"
One of the things we’re proudest of at YouTube is that this is a platform where experiments are born. Some fail to take off, and some move on to position themselves to be part of popular culture such Saudi wives making hilarious sketches about everyday life or powerful social experiments that tell important stories. This appetite to experiment with new formats of storytelling and narratives is something we want to support, and the Space is our way of celebrating this creativity. The Spaces program is designed to have something to offer all creators. Channels just starting out on YouTube with more than 1,000 subscribers will be welcome to sit in on workshops and events we will be holding at the Space. Creators that passed the 10,000 subscriber mark will be able to book the Space’s studios and production equipment. YouTube Space Dubai is the 10th Space in the world after London, Tokyo, Los Angeles, New York, Mumbai, Toronto, Paris, Berlin, and Sao Paulo. Since the first Space opened in 2012, we’ve had more than 400,000 people visit us to attend events, workshops, or to make their videos. The Space comes at an important time for the Arab world as it experiences an increase in the number of channels uploading from MENA countries by 160% in the past three years. Today, there are over 30,000 channels with more than 10,000 subscribers. Another big indicator of how far we’ve come is the fact that there are now more than 200 channels in MENA that crossed the million subscriber mark, with 1 in every 4 creator channel being female-led. Five years ago, MENA had less than five million-subscriber channels, and we’re just beginning to scratch the surface. Over the next couple of months, slots will be limited while we work with creators to study the needs of the local community to best provide the programmes and tools and ensure we provide the best support we can to our visitors. Creators will be able to book their production slots by early June. To all the creators out there, start thinking of what your next video is going to be about. You might just shoot it at the YouTube Space at Dubai Studio City where we look forward to welcoming you and your ideas. Posted by Dana Baddar, YouTube Space Dubai Manager. Creators are the heartbeat of YouTube. They make it the platform where more than one billion people around the world come to laugh, learn, and think. Over the past few years we watched as Arabic content on YouTube evolved to span hundreds of channels followed by millions of people. This transformation was spearheaded by a diverse and growing community made up of creators from almost every corner in the Middle East and North Africa region. Today, I am proud to announce that this community now has a new home in the YouTube Space at Dubai Studio City, a facility dedicated to them and all their production needs. Video Snapshot: You'll get a snapshot of how your newest video is performing compared to your previous uploads over the same time period. Previously, you had to pull this data from multiple sources and calculate it on your own. Personalized Recommendations: Here we'll surface Creator Academy content based on the specific needs of your channel. In the future we’ll also help you understand why certain videos perform better than others so you can adapt your plans for future videos. News: You shouldn’t have to search for the news; it should come to you. With this feature, you’ll get the latest updates from across YouTube so you can easily stay up to speed on everything that affects the creator community. The Dashboard will roll out to all channels over the next couple of weeks and we’ll continue to add more content based on your feedback. We're dedicated to making YouTube one of the best places for creators and hope these new features help make that possible. Posted by Assaf Reifer, Product Manager for YouTube Analytics and Ezequiel Baril, Product Manager for YouTube Studio. One of the most important tools for creators is the Creator Studio: the hub where you upload videos, manage your channel, and grow your community. In June of last year we announced a new beta version, renamed YouTube Studio. Hundreds of thousands of creators have been using the beta and providing invaluable feedback, which we've been implementing to make YouTube Studio a more efficient, empowering and enjoyable tool for you. Over the coming weeks, we’ll begin to make YouTube Studio the default experience for many creators (but will still give you the option to go back to Creator Studio Classic if you want to). 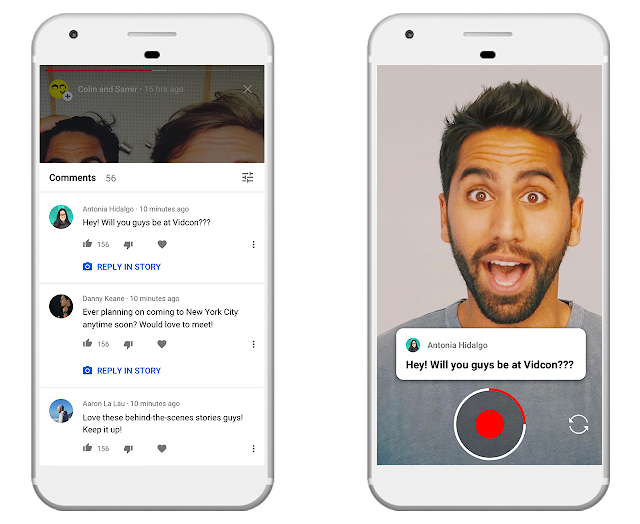 YouTube Studio’s most anticipated features include three new metrics that will give you better understanding of how your videos perform, and an all new Dashboard that shows you personalized news and information for your channel. Moving forward, you’ll see three new metrics in YouTube Analytics – Impressions, Impressions click-through rate, and Unique Viewers – that give a deeper understanding of your reach on YouTube. These new metrics are rolling out to a small group of creators today and will be available to everyone in YouTube Studio within a few weeks. A couple of weeks after that they will be available in Creator Studio Classic. An Impression is counted when a viewer on YouTube sees one of your video thumbnails. Impressions tell you the potential reach of your content on YouTube, since each impression is an opportunity to earn a view. It’s important to note that the impression metric only reflects impressions generated by your thumbnails on YouTube, including thumbnails on the homepage, subscription feed, search, and “up next” section. This help center article describes in detail what is and isn’t included in the impressions metric. We’re also adding Impressions click-through rate, which shows you the percentage of your impressions on YouTube that turned into views. Different factors affect your click-through rate. For example, effective thumbnails and titles that attract your target audience may drive this rate up. This metric can help you make more informed decisions on how to optimize your titles and thumbnails, especially when you look at how this metric changes between past videos. For more best practices, we recommend you read this help center article. Unique viewers shows the estimated number of different people who watch your videos over a period of time. Whether they watch on desktop, mobile phone or watched more than one of your videos, that person will count as one unique viewer. You can use this data to compare your audience size to your subscriber base, and identify videos that helped reach a wider audience. This information can also help guide your content strategy, and showcase your true reach when discussing brand deals and sponsorships. We encourage you to check out our Creator Insider Video, Creator Academy lesson and help center articles for additional tips on how to use these metrics. You’ve asked us for a “one stop shop” for data, insights and news so you don't have to spend time searching for it. The new dashboard will now provide a snapshot of your latest upload, personalized recommendations, and instant access to news.